The company is continuously focused on the improvement so that the customers can be retained; the company is improving constantly. However, the company believes in the great shopping experience for the customers, diversity and inclusion, design for all, fun and rewarding place all the points are discussed by the company in “What we believe”. Moreover, the company mission and philosophy is to grow and focus on the continuous improvements, for the improvements, the company is focused on achieving the quality, their mission is to ensure efficient performance, operate ethically, high-quality products and reliability and with the purpose of achieving the mission, the company is working hard for the best potentials in the market. The company is focused from every perspective so maximum performance can be shown, for the sustainability, the company is delivering the safe and quality products, and improvements can be seen in the products. The company is continuously recalling the products and taking feedbacks from the stakeholders so the betterments in the products and services can be bought. The company has the strong business ethics, Target cooperation is well known for the providing the legal standards in the market, the company has a good name in the industry; the good name is because customers are satisfied. The customer can only be satisfied if they see that product or services are meeting their requirements and the services are updating with the new time and technology (Corporate.target, 2016). Target cooperation believes on improving constantly, with the time the system and processes improve, there is continuous analysis for the improvement so that the betterment could be seen, the company emphasis on the training and education of the employees, so the work could be done in a better way and performance target can be achieved. However, improving continuously and forever, the company has focused on the design and innovation processes. The designs are energetic and surprising, the innovation is done to satisfy the needs and wants of the consumers and of the other stakeholders, and the companies have undertaken the expert advice and eyes so that proper designs and ideas can come out. The company has focused on the technology so thing, product or services can be existing, the shopping experience for the customers is more focused so the customer feels important and can easily buy the products. There are continuous improvement and innovation. The company and managers are the focus to training the employees, and there is the culture of innovation, the employees are focused on bringing the new ideas and designs for the company, in order to increase the productivity and profitability (Corporate.target, 2016). Target cooperation is focused on all the process to satisfy the customers and other stakeholders but the company still has to face the competition in the market because there are more companies, which are giving better than the Target. As the company is focused on all the processes but still lacking in managing little function, which is, may be unclear or unseen, the company is focused on coping up with the problems. 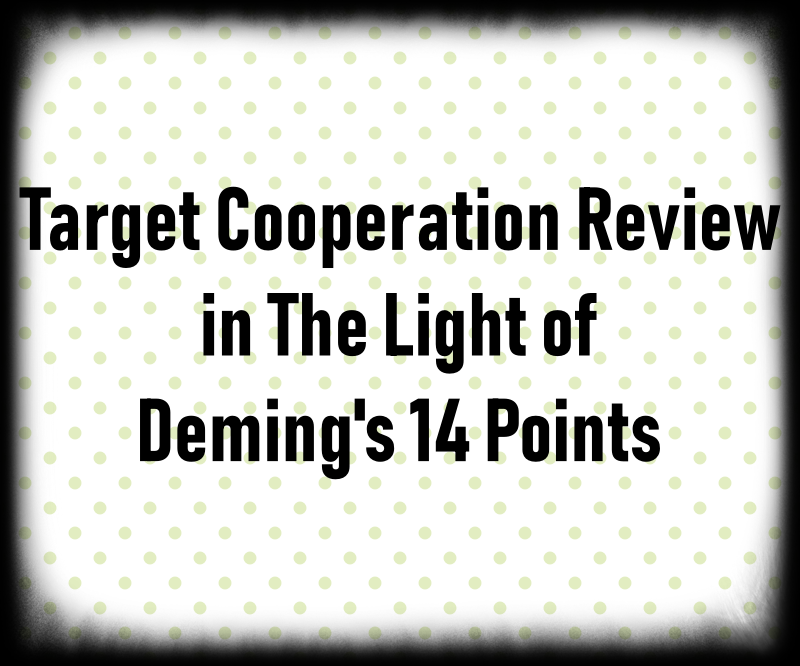 Target cooperation, is focused on the TQM and Deming points but are lacking in few Deming point, as they have implemented but failed to manage the processes. With the suppliers the target is working in a close partnership, to give the value to the deliveries, the innovation processes are being focused, they give respect to the guests and communities. They have the partners in supplier’s diversity, but the company is facing the problems in managing the supplier’s relationship, there news that supplier are unhappy and management has to face the problems regarding the supplies of the products. The company has not applied the Deming point one supplier for one item, maybe this is the reason that company is failing or facing difficulties in managing the relationship because supplier relationships are more concerned. The company is focused on the improving the logistics or supply chain; the company has not managed the inventory in better ways, the business or the company has learned that it is a struggling business and to manage all the backroom or warehouses is difficult. The logistics need to compete in the industry, Target Cooperation need to focus on this Deming point, so better could be there and tough competition can be given to the other retailers in the market. There is tough competition in the market, in the market, there is a total mess between the brokers or suppliers (BASKIN, 2016). To eliminate the fear from the organization there is the need to allow the people to work in the best manner so that the performance can be ensured, the goals needed to achieve the high quality, there should be no blaming in the organization and workers need to give importance or value by the organization. To get safe from the conflicts TQM approaches can serve as best, the Deming point eliminate fear is not followed by the Target Cooperation because an employee is not free there. As according to the report in the Wall street Journal, the workers have to work all the time at the grocery stores, there is the focus on the innovation perspective but the employees do not to me or are not free to share their ideas. However, the team is given the special training that how to deal with the customers and problems, but employees are handling groceries inventories all the time or dealing with customers etc (Reilly, 2016). Target cooperation is hiring the new employees, to solve the problems or issues, however, to eliminate the fear is important, for the betterment, there is the need to focus on all Deming points so the betterments could be there. Eliminate fear in any organization is important because when employees are free to work, the innovation takes place in the organization, the value should be given to all the workers or employees so they trust the organization and work hard for the achievements. The Target also needs to think to retain the customers through doing innovation in the processes, products or services. Kanji, G. (2012). Total Quality Management: Proceedings of the first world congress. Springer Science & Business Media.